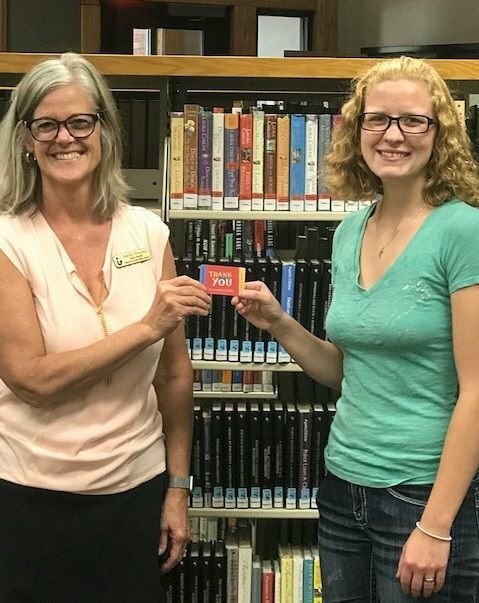 Library Director Tammy Peasley, left, presents a gift card to Alyssa Ross. 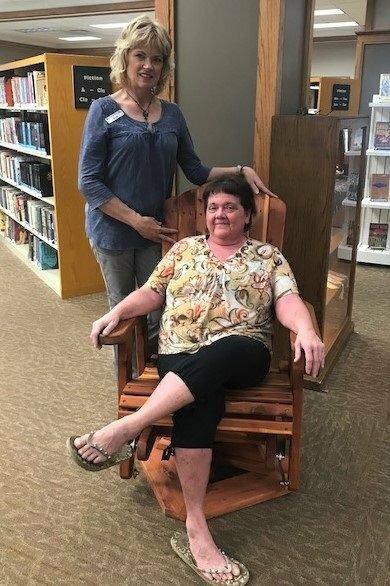 Cedar Rocker/Glider winner Pamelia Waughtal sits in her new rocker with Library Services Coordinator Vicki Fisher. The Black River Falls Public Library has wrapped up a successful 2018 Adult Summer Reading Program. The theme for this year’s Summer Reading Program was Libraries Rock!, and the total number of adults who participated in the “reading” portion of the program was 66. Those 66 participants returned a total number of 479 completed bookmarks for books read during the program period of June 9 through Aug. 3. The lucky winners were chosen by drawing two of the 479 bookmarks that were returned to the library. Pamelia Waughtal won the cedar rocker/glider donated by Black River Furniture Outlet. Alyssa Ross received a $50 Barnes & Noble gift card donated by a library patron.